Over the last six years, Oscar has chosen nonfiction adaptations as Best Picture contenders, and 2014 is no different with 5 films in the category inspired by true events. One such film is Captain Phillips, the story of the 2009 hijacking of a U.S. cargo ship off the coast of Somalia by native pirates. 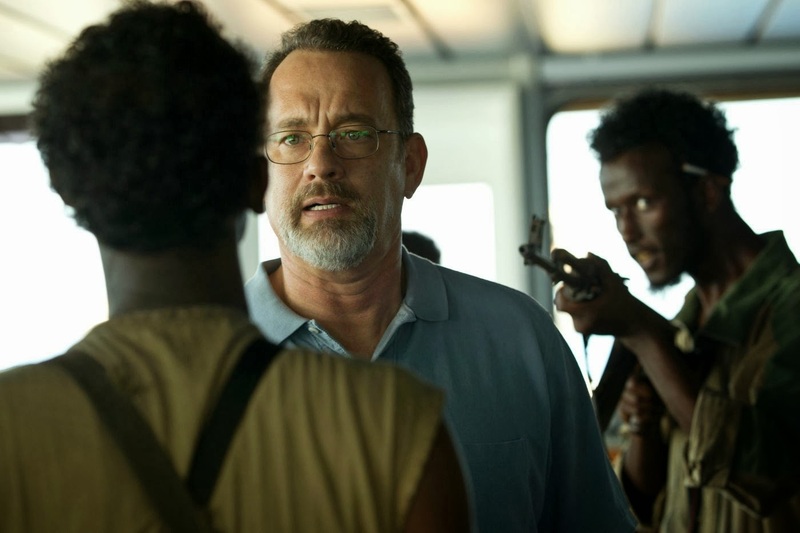 The film, starring Tom Hanks as the titular character, was directed by Paul Greengrass (Bourne Supremacy, Bourne Ultimatum, United 93) and features newcomer Barkhad Abdi as the pirate leader Muse. Watching this film you are reminded of past films with American political undertones like Zero Dark Thirty, Act of Valor and most recently Lone Survivor, preying on the sensibilities of the viewer and the opportunity for the “rah-rah” American pride propaganda vehicle to run roughshod, but Phillips quickly changes course, focuses the attention on the Somali plight, and the pirates’ motivation for doing what they do. This brings a very solid balance to the film, and even though you don’t want to root for the “bad guys” you can’t help but feel a bit sympathetic to the inspiration behind the attacks. Forced or not, the film brings to light the old adage of there being three sides to every story: yours, theirs, and the truth. Greengrass’ direction isn’t without its flaws, however, and the most glaring detractor from this film is its length. There were a few moments that left viewers shrugging their shoulders wondering why this particular scene was so long or even there at all. It’s almost as if Phillips force-fed the drama in certain spots, instead of letting the story be told organically. But if anyone can evoke emotion out of an audience by using very little, it’s Tom Hanks. Greengrass could have shortened the film by about 15 minutes, more or less. However, the moments of tension from the cat-and-mouse approach of the pirate boat versus cargo ship and the crew members avoiding capture to the rescue of hostage Phillips was very palpable and paced beautifully. Even with the lengthy run time, Captain Phillips kept you on the edge of your seat. People have come to know Tom Hanks as the true professional actor, and in this film he shows nothing short of brilliance, but the movie clearly belongs to newcomer Barkhad Abdi. It has been well documented that Abdi had no formal acting credentials before Captain Phillips, and it’s very hard to believe because he truly steals every scene he’s in, including those with Hanks. He has a presence on-screen that both terrified you and intrigued you, which made completely despising him impossible. The film explored the motivations of man and how far one is willing to go to survive, and the journeys both characters took were as varied as they were fascinating. Abdi’s nomination for Best Supporting Actor is well deserved and it is with hope that it helps springboard his career into the stratosphere. Captain Phillips is out now on DVD and Blu-ray.